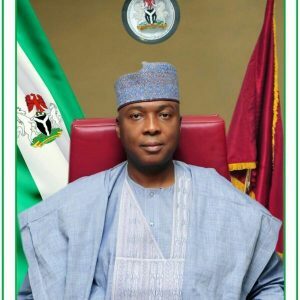 The Peoples Democratic Party (PDP) has raised a strong team headed by the Senate President, Dr Bukola Saraki, to aid the election of the party’s candidate in the forthcoming governorship election in Osun State. The team tagged National Campaign Council for the governorship election in Osun State have many of the party returnees as members, including governors of Sokoto and Benue states, Aminu Tambuwal and Samuel Ortom. The PDP National Organising Secretary, Colonel Autin Akobundu (rtd), in a statement on Saturday released the list, which also has other PDP governors and Deputy Senate President Ike Ekweremadu as members. According to Akobundu, the council will be inaugurated by the party's leadership on Monday in the nation's capital. He said, “The National Working Committee (NWC) of our great party, the Peoples Democratic Party (PDP), has approved the composition of the National Campaign Council for the September 22, 2018, Osun State Governorship Election. Governor Ortom and Senator Saraki defected from the APC to the PDP in July while Governor Tambuwal joined the opposition party in early August. Meanwhile, the PDP has also appointed Dr Eddy Olafeso as the secretary of the Council. Other members of the Council are former Vice President Atiku Abubakar, and former President of the Senate, Senator David Mark. Also included are former PDP Caretaker Committee Chairman, Senator Ahmed Makarfi and a chieftain of the party, Olabode Gorge, among others. PDP's Senator Ademola Adeleke and Mr Gboyega Oyetola of the All Progressives Congress (APC) will contend with the candidates of other political parties in the coming election for Governor Rauf Aregbesola's successor.